How do I go to the last post in a topic if it is marked as read? Normally I would click on the last page but page numbers do not seem be visible. Aha! Never mind. If you click on the activity time, it takes you to the last post. You found that before I did! With regard to page numbers - there aren't any, because thread aren't broken into pages. If you scroll to the bottom of a page, and there are more recent posts, they just load - works kind of like Twitter? This has real potential, I think, for game threads. As posts are added, they'll just appear at the bottom of the thread - no need to refresh the screen, no need to move to the "next page." In the category (the thread listing, not the actual thread), click on the time in the right-most column, and it will take you to the bottom of the thread. I hit "g" "h" and then click on the "Unread" button, which takes me immediately to the threads that have unread posts. I'm going off to have dinner now - back in probably about 90 minutes.. If you have an issue (with the board! ), post about it, and collectively we'll figure out how to overcome it! I think we might need a message notification at the top of the board...is that an option? I have no idea, but I'll try to look into it. I know there's no simple option to "turn on" to do that. There is a user preference you can set to email you if you receive a message; I've set that (for myself - it's a user preference, so each user can choose whether to set it or not). I access PP.com via an iPad. I cannot figure out how to use the keypad shortcuts. Perhaps they only work for PC users (that have actual physical keyboards)? I can no longer logon via Tapatalk (error message says a plugin is missing). Access to the site using a browser seems to work fine though. Are there any recommendations for mobile users....best access to PP.com via browser, Tapatalk, other app? Mobile support is built into Discourse (the new board software), so mobile access is with your mobile browser. No third-party app needed (and maybe none available?). On my iPhone (and I presume generally on smaller-screen mobile devices), the site uses a slightly different interface, that drops the "secondary" stuff that appears on the right side of the screen on my Mac - for instance, the Categories page displays the categories list, but not the "Latest" list that's on the right side on the Mac. I can switch to that view, but you get one at a time (makes sense, given the limited screen real estate). Based on very limited testing with my first-generation iPad (which can barely run a browser...), on larger-screen mobile devices, the site seems to use the same general layout as on PCs/Macs. I haven't got the hardware/software to test it, but depending on the browser you use on an iPad, you may be able to have the browser "pretend" it's on an iPhone, if you want to use the interface that's engineered for smaller screens (with non-Safari browsers, you can control what "user-agent" the browser represents itself as to web sites). I'm having trouble getting the latest post on a thread displaying on the top of the page. Is it possible to change this? To quote another post supposedly the keyboard shortcut is "q", but I'm having trouble figuring out how to apply it. The only way I can see how to quote is to highlight the post and quote marks will appear which can then be clicked on. I haven't figured out the keyboard "q" shortcut, but here are two ways to quote another post. If you select (highlight) the post - or just a part of the post - that you want to quote, you'll get the "quote reply" button. If you click on that, or on the "Reply" link under that post, it opens the reply text field with the highlighted material already quoted. I highly recommend using this feature to respond to one point in a long post - just quote the part you're responding to, rather than quoting a whole (sometimes really LONG) post. If you just click on the "Reply" link, it opens the reply text field. If you then click on the little balloon icon in the tool bar, it pulls in and quotes the entire post you're replying to. If you're talking about having the thread display in inverse order - newest post at the top, with progressively older posts as you scroll down - no, I don't think Discourse does that. From the category listing (e.g., you're in Renegade Phan Phorum, looking at the list of threads), you can go immediately to the latest post in a thread by clicking on the time in the Activity column (the right-most column). Here is one of the articles I read while the board was down on Middleton being designated as the front of the organization. It did say he is 48% owner. The limited partnership prohibits any owner gaining majority ownership. 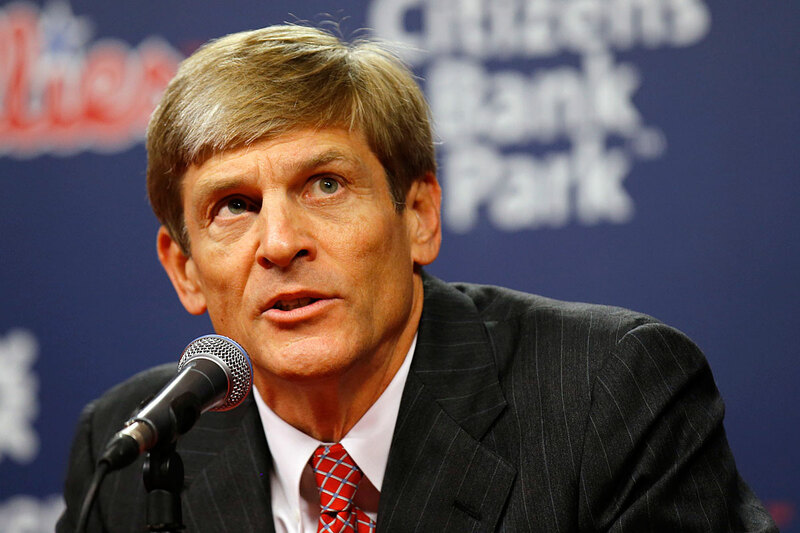 Major League Baseball's owners on Thursday officially designated John S. Middleton as control person of the Phillies, the last step in a transition of power from David Montgomery to Middleton. The really cool thing about this post? LSP just dropped the link to the philly.com article into his post - the board created that llink, with image and starting text, all on its own. The board calls these things "oneboxes," but whatever they're called, they're bloody elegant! Yes, this is a great feature. I discovered it yesterday when trying to figure out how to embed a link into a description of what the link was about. I commented that I didn't know how to do that yet, so I'd just put the link in my post. Lo and behold, a beautiful result. Love this feature. I just checked out this thread on my iPhone using Safari. It is very easy to read and looks good. I haven't explored all the features, but I think this is going to be okay. Usually, I post from my laptop or desktop computer. Just for fun, I'll try a reply to this from my iPhone. Tried using a quote from my iPhone but can't get it to work. So I'll do a regular reply. Oh, you'll just love keying in any kind of coherent message on the iPhone keyboard - not! But seriously...yes, the mobile implementation is pretty well done. It will be an adjustment for those who got used to Tapatalk - but it's intrinsic to the board, as opposed to a third-party plug-in with periodic issues (and yes, Tapatalk had issues from time to time, which Chris had to deal with). One software package to maintain, update, etc., instead of two. Back on my laptop and can get the quote to work fine. I went back to the iPhone and checked again. The bubble and line of options doesn't appear there when I click on the reply arrow. I'm sure it's there somewhere. Learning a new system is fun. A note on editing your posts. If it is your post, the line at the bottom right of the post will have a pencil icon between the link and ... icons just to the left of the arrow Reply. If it's not your post, you see the heart, link, ... and then the Reply. If it's your post, no like but rather it's link, edit, ..., and then Reply.